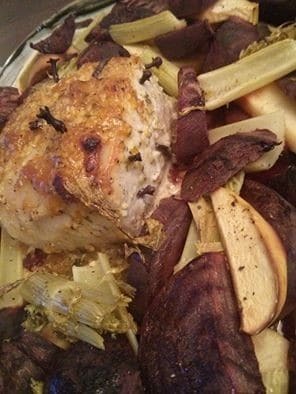 Surround the roast with sliced beets, Golden Delicious apples, and celery. Season with salt & pepper and a light drizzle of oil. In another roasting pan, place quartered potatoes with seasoning salt and oil. Bake everything together for about half an hour at 400°F. Makes for a surprisingly fast roast with so much flavor!